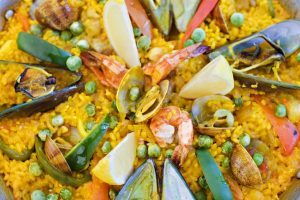 Paella Valenciana and its seafood variation originated in the early 1800s in Spain’s Valencian region near lake Albufera. Prior to the 19th century, the ingredients for Valencian paella varied greatly with the most unusual being marsh rat. Valencians consider Valencian paella and seafood paella as authentic. They view all other variations as impostors. This recipe is based on the one that Chef Juanry Segui serves in his restaurant with plenty of detailed explanation for those attempting this for the first time. Clean the snails, poultry and rabbit thoroughly. Cut the poultry and rabbit into small pieces and salt them generously. Pour olive oil in a paellera and, when hot, sauté the poultry and rabbit pieces until golden brown. Add green peppers and sauté for one minute. Add the garlic and sauté until brown. Be careful; garlic burns easily. Once the garlic is brown, add the paprika followed quickly by the tomatoes to prevent the paprika from burning. Sauté until the tomatoes become dark and pulpy and the mixture has reduced a bit. Add the water and bring it to a rolling boil. Then add the snails, fresh haricot beans (if canned, continue reading to see when to add these), runner beans (or green beans) and saffron (and/or food coloring). Allow the mixture to boil for 10 minutes over a high flame. After 10 minutes have passed, you should have a flavorful broth. It’s customary at this point to allow your dinner guests to taste it. The purpose is to determine if the broth needs more salt. If so, add more salt, a pinch at a time, until everybody is satisfied. Add the rice and stir it using the rice skimmer. Then, once again with the skimmer, spread it over the bottom of the paellera. The coating of rice should be one centimeter thick. Let it cook over a high flame for 10 minutes. Then reduce the heat to medium and let it simmer for four minutes. Add the canned haricot beans and reduce the heat again to low and let it simmer for another four minutes. Taste the rice about once every four to five minutes. You’ll know it’s done when it’s slightly firm to the bite. Italians use a similar approach when cooking pasta. Italians call this texture al dente. At this point, there should be some toasted rice sticking to the bottom of the pan. This is a delicacy in Valencia called socarrat. If no socarrat has developed, increase the flame to high and listen for the crackling sound of rice toasting at the bottom of the pan. Reduce the heat to low once the aroma of toasted rice wafts upwards. Remove the pan from the heat when the rice is almost dry and place the rosemary branches on top. Cover with a clean, white towel (a white towel prevents dye from leeching onto the paella) and wait five minutes before serving to allow the rice to absorb the remaining broth.